2 sets here that should be near but not too failure. If you aren’t sure where to start in regards to loading try between 60 and 70%. Try to minimize the pause at the top of the rep and keep the barbell moving. 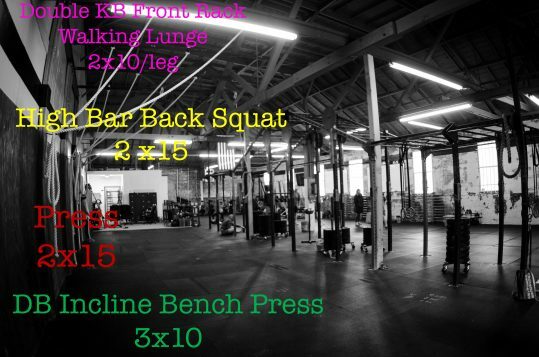 Using a set of KB’s in the front rack for this one and working for a total of 20 reps (10/side). You can do this stationary or moving through the room, whichever works best for you. No legs on this one so keep it legit. Adjust loading between the two sets to make sure you are hitting the sets of 15 and like other work, near failure but not to it for each set. Same rules as the other lifts today in regards to your work sets. Rest 2-3 min between sets and adjust loading so you have successful work sets.